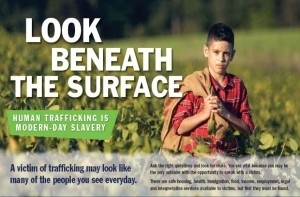 Anti-trafficking campaign by United States Catholic Bishops Conference (USCCB). Traffickers of people are not necessarily violent men who use force against women. All the people I spoke to at a meeting of the Christian Organisations Against Trafficking Network (COATNET) in Madrid meeting said not much is known about traffickers in general. One thing’s for sure, they’re very astute. Lifting the lid on human trafficking is vital. Many of the organisations belonging to COATNET raise awareness and educate communities on trafficking to tackle this. Lifting the lid on human trafficking is vital. Often organisations ask the help of people who’ve returned from being trafficked to raise awareness. Such awareness raising is vitally important. People often sign up with recruitment agencies in their own countries advertising well-paid jobs or they are ‘befriended’ by someone and taken abroad. Both methods lower people’s barriers so they are less likely to take precautions against exploitation. Once abroad they may find themselves isolated as a domestic worker in someone’s house, working long hours and having their passport taken off them. Here are some other signs of trafficking from the US bishops’ conference. George Joseph from Caritas Sweden told me about Lourdes (name changed) who was trafficked to Sweden from El Salvador. Another Salvadoran woman befriended her and told her about great job opportunities in Europe. She had three children and a sick mother and desperately needed money. On arrival, Lourdes discovered her the documents the woman had provided were false. She was made to work daily 16 hours in a restaurant for 17 euro – some of which she sent to her family. The rest of the money she would have earned went to pay off her ‘debt’ to her traffickers. She was moved around a lot and told that if she tried to escape, the traffickers would hurt her children. The surprising thing is that once she was rescued, she decided she’d like to migrate again. Knowing the pitfalls, she thought she could make a success of it the second time and be able to make enough money to support her family. The desperate poverty in some countries means that people are willing to risk exploitation and sexual abuse abroad rather than stay and not be able to put food on the table for their families. People who fall prey to traffickers are often desperate to improve their own and the lives of people around them. If they are duped by traffickers, they feel great shame and sometimes don’t even want to return home. Sadly, some people who are trafficked never do return home. Fr George Sigamoney from Caritas Sri Lanka told me the story of a young girl who was trafficked from Sri Lanka to Saudi Arabia. She committed suicide after being abused while working as a domestic worker in a family. The day before she died, she phoned her parents to say everything was fine.